Krishna Jagatia, Nisha Singh, Sachin Patel. Background: Decrease in amniotic fluid volume or Oligohydramnios has been correlated with increased risk of intrauterine growth retardation, meconium aspiration syndrome, severe birth asphyxia, low APGAR scores and congenital abnormities. Early detection of oligohydramnios and its management may help in reduction of perinatal morbidity and mortality one side and decreased caesarean deliveries on the other side. Aims & Objective: (1) To study affects Oligohydramnios on fetal outcome in form of (a) Fetal distress (b) Growth retardation (c) NICU admission (2) To study APGAR scores of newborn babies in relation to Oligohydramnios (3) To study incidence of congenital malformation (4) To study early neonatal morbidity and mortality (5) To study maternal morbidity in form of operative delivery and induced labour. Material and Methods: Present study was done over a period from May 2009 to November 2011. 100 patients in third trimester of pregnancy with Oligohydramnios selected randomly after satisfying inclusion and exclusion criteria. A detailed history and examination were done. All required investigation done. Oligohydramnios confirmed by measuring AFI. Results: Mean maternal age-23.66 years. Incidence of oligohydramnios was more in primipara (52%) in our study. And operative morbidity was also more in primipara. Most common cause of Oligohydramnios is idiopathic (52%). Second commonest cause is PIH (25%). Operative morbidity is highest in PIH (60%). Operative morbidity was significantly higher in NST (non-stress test) non-reactive (3.12 ± 75=78.12%) group than NST reactive (26.47%) group. Most common reason to perform caesarean was fetal distress which was either due to cord compression or IUGR. 7% patients were found with fetoplacental insufficiency on Doppler study. Oligohydramnios was related to higher rate of growth retardation and NICU (neonatal intensive care unit) admission. Conclusion: Oligohydramnios is frequent occurrence and demands intensive fetal surveillance and proper antepartum and intrapartum care. 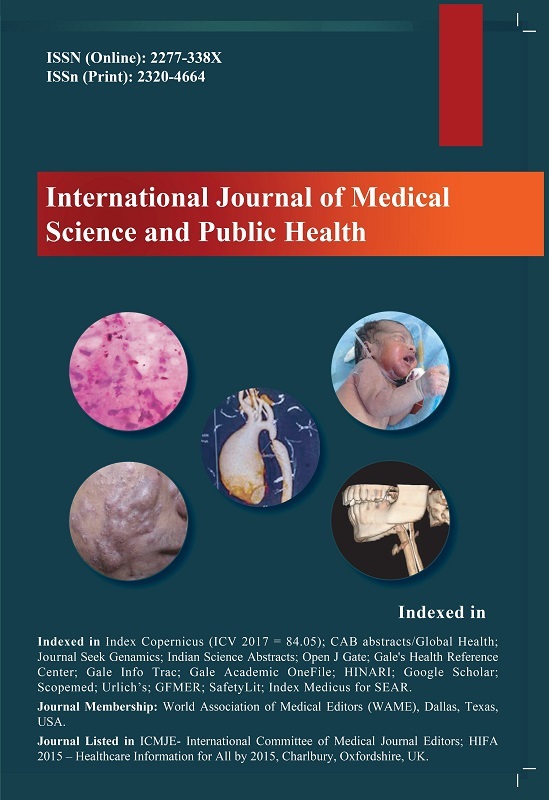 Due to intrapartum complication and high rate of perinatal morbidity and mortality, rates of caesarean section are rising, but decision between vaginal delivery and caesarean section should be well balanced so that unnecessary maternal morbidity prevented and other side timely intervention can reduce perinatal morbidity and mortality. 7. Umber A. Perinatal Outcome in Pregnancies Complicated by Isolated Oligohydramnios at Term. Annals 2009;15:35-37. 9. Jandial C, Gupta S, Sharma S, Gupta M. Perinatal Outcome After Antepartum Diagnosis of Oligohydramnios at or Beyond 34 Weeks of Gestation. JK SCIENCE 2007;9(4):213-14. 15. Johnson JM, Chauhan SP, Ennen CS, Niederhauser A, Magann EF. A comparison of 3 criteria of oligohydramnios in identifying peripartum complications: a secondary analysis. Am J ObstetGynecol 2007;197(2):207.e1-7. 19. Sriya R, Singhai S. Perinatal outcome in patients with amniotic fluid index < 5cm. J ObstetGynaecol India 2001;51:98-100. J Obstet Gynecol India 2017; 67(2): 104. J Obstet Gynecol India 2016; (): .